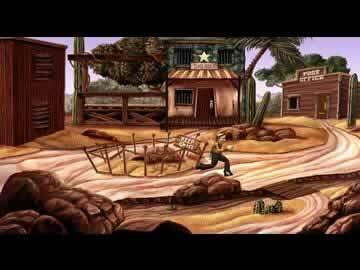 Al Emmo and the Lost Dutchman's Mine Game Review - Download and Play Free Version! Witty and delightfully sarcastic dialogue. Unique story line that will keep your attention. Voice acting for main character is incredibly annoying. With limited background music and sound effects, can feel a bit slow paced at times. Help Al Emmo Find True Love and Tons of Treasure! Meet nerdy Al Emmo. It's just his luck to lose his mail-order bride when he arrives to pick her up in the small town of Anozira. Without a bride, Al soon falls for the bar singer, Rita, and now this hapless hero must fight for her love! When you aren't fighting the big Spaniard Antonio Bandana to win Rita's love, discover the secret treasures of the Dutchman's Mine in this hilarious Wild West tale. Encounter beautiful landscapes, a town full of pop culture references and a memorable cast of characters, from a missile-wielding gopher to a cola-addicted Indian chief. Al Emmo and the Lost Dutchman's Mine presents traditional adventure gameplay with a lot of humor. Gameplay involves clicking to navigate around the various scenes and looking at, touching and speaking to various characters and items. Explore very carefully and keep your eyes peeled for a variety of inventory items. Use these items to complete many challenging, humorous and engaging puzzles involving combining and using various inventory items and questing after the Wild West versions of present-day popular stars. With a quirky cast of characters and tons of amusing commentary, don't be surprised to find yourself laughing out loud at some of the wild situations Al finds himself in. 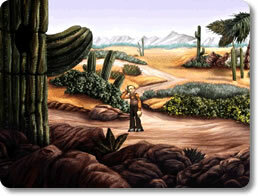 This witty western has a healthy dose of adventure and many puzzles to keep your brain rolling. Enjoy hours of fun, interesting gameplay and put your problem solving skills to the test with this intriguing title. If you are a fan of point-and-click adventures with plenty of humor, then download Al Emmo and the Lost Dutchman's Mine and start your journey today! Al Emmo is a middle aged man with no job, lacking in stature and a full head of hair, who lives with his parents. After traveling to meet his mail order bride in Anozira, a near ghost town out west, his potential lover is unimpressed with his demeanor and general appearance, leaving him in haste, stranded in the middle of nowhere. Our protagonist then begins to explore the town and outlying areas, biding time until another train rolls through town. Two story lines intertwine in this thoughtful game, Al Emmo's search for an acceptable, or rather any bride and the mystery of the lost Dutchman's mine which features the main character delving into both issues. Dialogue is particularly witty and rather enjoyable, including such prevalent pop culture references as the first chapter titled “Dude, where's my train?” However, the voice acting for the main character, Mr. Al Emmo, is cumbersome and his high pitched, whiny, and squeamish tone grows annoying rather quickly. In addition, there is no background music unless entering a location such as the saloon in which another character is playing an instrument. The effect of this can make the game seem a bit dull and slow moving at times, but generally speaking the creative plot will keep you intrigued. Graphics are not particularly noteworthy or original and serve as a minor detractor from the overall experience of game play. However, mini-games are exuberantly creative and challenging and are woven into the plot seamlessly, including mixing wild, outlandish drinks such as the “Flaming Kev” without any knowledge of their ingredients. On the whole, Al Emmo has its downsides that may result in a less appealing game, namely the overwhelmingly annoying voice acting of the main character and tendency towards a slow moving, possibly boring pace, but this game is worthwhile to players seeking a true adventure and challenge, and most audiences will be joyfully amused by the witty, sarcastic dialogue and original plot line.